It has been a while since my last blog post, but I wanted to continue the story of my vacation. It sets the context for what comes next. I'm back-dating this post to the time when it takes place. Mike and Ellie were kind to offer me the use of the attic bedroom, which was just lovely. I felt like I had a personal retreat centre in the middle of a family home, with a view overlooking the beach and, further on, the ocean. Sunday morning we had mass at a nearby parish, and then I got busy doing... nothing. Well, not quite. Personal prayer was a big part of this time off. In addition to the Liturgy of the Hours I went on prayer walks along the beach and through the neighbourhood, rosary beads in hand. 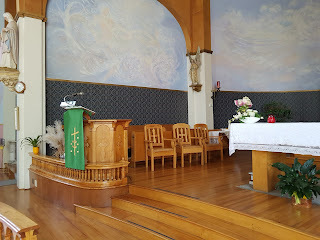 I also made it for mass at the local parish each day, where the pastor and his assistant (and indeed, all the people I met) were warm in their welcome. 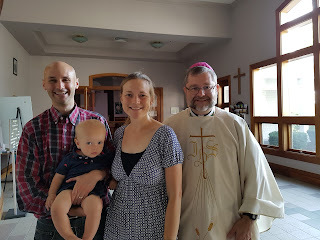 A lovely family I got to know, with a connection to Montreal! Spiritual reading was also a big part of my time. 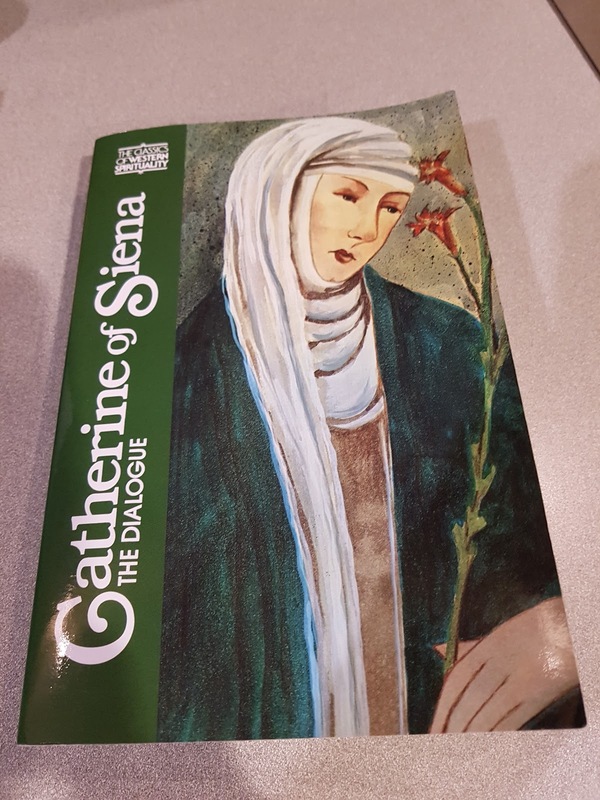 Some months before I had read the Dialogue of Saint Catherine of Siena, but it was a library copy so I wasn't to mark it up with pencil and write notes in the margin like I usually do to really appropriate a book and its contents. Since then, however, I had bought my own copy, and my goal was simply to re-read it and see what I might get out of it a second time. I have to say, I was not disappointed. Wow, this woman was true genius of the spiritual life, tackling deep issues like heaven, hell, joy, and pain. It is not an easy read, not because the language is tough, but because it is so deep. I was looking forward to a week of this, reading, praying, and relaxing in the company of good friends. Unfortunately, it was not to be. Tuesday night (Aug 22), three days after arriving, I got a message from my brother Chris, so I gave him a call. It was among the worst news possible: he had just been diagnosed that day with Amyotrophic Lateral Sclerosis (ALS), otherwise known as Lou Gehrig's disease. We spoke a bit, and then I hung up the phone, wondering what I should do next. I wrote my last blog post just before leaving on vacation. Now that I am back at work, I thought I should write about it. A lot happened, things that I can say without exaggeration changed my life. My vacation time started with a long, leisurely drive to the lovely state of Maine. Actually, to be honest my vacation started with an attempt to drive to Maine the day before, but a flat tire and a driving rainstorm put the kibosh on that plan. A friend and I took in a film that night instead -- Valerian and the City of a Thousand Planets. Wow, was it dull. I know that vacations are meant to be for rest, and I was pretty tired, but I rarely start to fall asleep in a movie theatre. The film really earned its bad reviews. The drive to Scarborough (just south of Portland) was lovely. 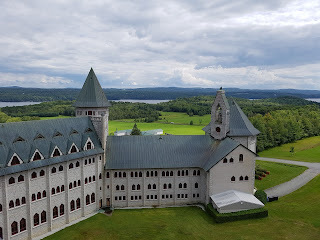 I stopped at Saint Benoit du Lac abbey on the way for a brief time of prayer. I should have known that would never work: I was spotted by a monk who spotted me for a bishop, and he offered to give me a tour. How could I refuse? After the monastery, I also dropped in at a small village sitting off highway 55 on the way to the border. 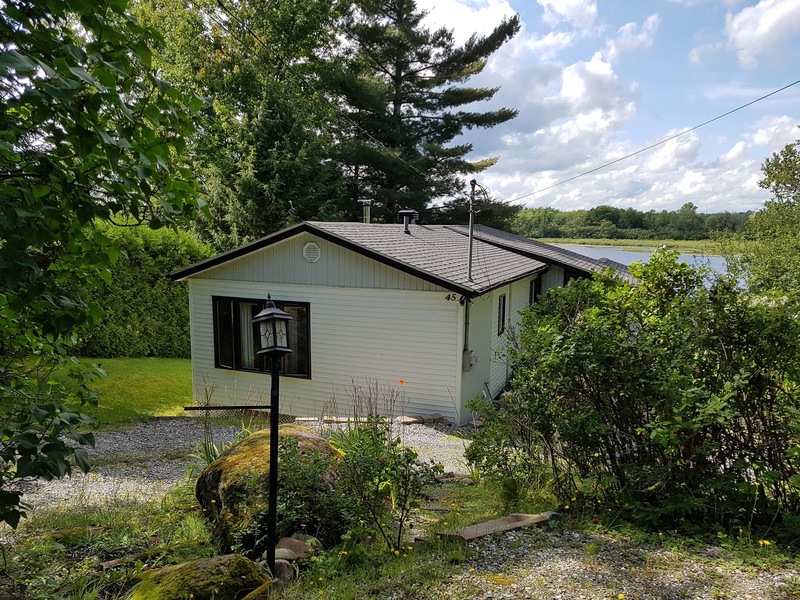 My parents had a cottage there back when the family lived in Montreal. In those days, the village was called Katevale, but today is called Sainte-Catherine-de-Hatley. Since "Kate" is an English diminutive for Catherine, either way the name makes reference to the lovely country church we worshipped at during the summers (and some winters) we spent there as a family. I have such fond memories of that place. The pastor at the time was so very kind to us, especially the kids. I still remember the priest coming for a meal at our cottage, and the impact that made on us. My brother and loved going to mass there, even though it was all in French and we didn't understand much. There was a wedding rehearsal going on, so I had a chance to go inside and look around. It seemed smaller than I remember, but the sanctuary was still set up the same way. I served mass there for the first time, and I still remember sitting in the big chairs next to the credence table, waiting for the priest to tell me what to bring over next. I headed a bit further down the road and found the path that led to where our cottage once stood. I have to say, it was hard to find. The new owners did extensive renovations, so I had to use and old landmark to identify it: a large rock that you can see in this picture that would have too big to move unless it was really necessary. After this trip down memory lane was done, I started for the border. The crossing to the USA via Stanstead put me first on an interstate, but there is no major highway that connects Vermont, New Hampshire and Maine. Pretty soon, I was crossing the Appalachians on country roads. I passed Mount Washington, which I would have loved to climb had I the time (I love mountains). I also drove past Bretton Woods, a place of legend for those of us who studied economics or finance. It was getting dark by the time I was getting close to the Maine coast. A fog had rolled in off the ocean, so thick I had to use the fog lights on my car for the first time. Now I know where Stephen King (a Maine resident) had gotten his idea for his novella The Mist. While I would probably have gotten lost if I was replying on street signs, GPS came to the rescue. Night had fallen, but I finally reached my destination: a house on Higgins Beach. The good news is that it was the rear tire. 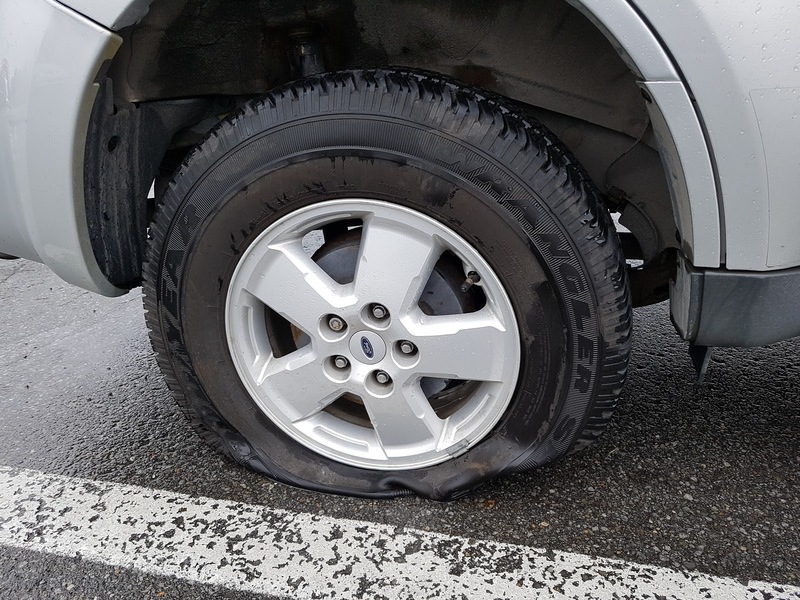 I was driving on highway 10 in heavy rain with moderate traffic, so if a front tire had blown there would have been greater danger of losing control. As it is all I felt was a lot of vibration, like I was driving on rough asphalt. I managed to get to the side of the road, and call CAA (AAA for my USA friends). Because I had CAA-Plus I could have gotten towed all the way to the Eastern Townships and have the tire replaced there. Unfortunately none of the garages contacted had the tire in stock. So I had to double back to Montreal to see my tire-specialist garage here. I am sitting in their waiting area as I write this. So much for the start to my holiday -- I was going to spend the afternoon with brother bishops at our gathering in Sherbrooke, and the evening with Archbishop Luc Cyr, but alas. Still, it could have been worse -- my plan was to drive tomorrow from Sherbrooke through the White Mountains to Maine, and I'm certainly glad the tire didn't blow while I was in the middle of nowhere. And nothing says I can't take a break and have fun in my hometown -- once I get out of here, of course! One of the ways that the province of Quebec is rather unique in the world is that its civil law includes a special statute on the governance of Roman Catholic parishes. It is a throwback to the old French colonial regime, when the king of France had a special responsibility for the protection and promotion of the Catholic faith. Quebec has not been a French colony for centuries, of course, and the current cultural climate definitely favours a separation of Church and State. That being said, this law is still on the books and still serves to provide the legal structure for Roman Catholic parishes in Quebec. Catholics growing up in Quebec are sometimes surprised to discover that there is no corresponding statute in other jurisdictions. On the other hand, Catholics coming to Quebec are usually quite surprise to discover the degree of legal “interference” that exists in the internal management of the Roman Catholic Church. This is especially true of priests and lay persons involved in parish leadership, who (if they come from elsewhere in North America) are often used to the model of a “corporation sole”. In this model, an episcopal corporation (headed by the diocesan bishop) actually owns all the parishes of a diocese: the subdivision of the diocese into parishes is handled internally within that overall legal structure (much as how a company might be divided into operating divisions that are not themselves separate corporations). A individual coming from this sort of environment often does not understand how to legally administer a parish within the Quebec context. 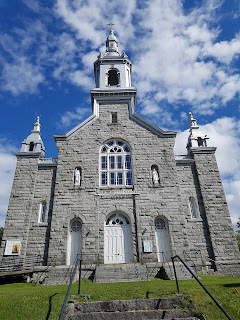 The purpose of this article is to try and clear up any such confusion, with an eye especially to helping people understand the practical ecclesiology of Roman Catholic parishes in Quebec. Human beings are social animals. They form communities. Some of these exist on the level of human nature itself, such as the family (the basic unit of society) or the State. The key characteristic of the State is that the people generally accord it the legitimate right to use coercion to enforce social policy. In other words, the State has the right to not only make laws but to enforce them. The State is obliged, however, to only use this power to promote the common good: if it fails to do so, the people (whether in whole or in part) will generally rebel in some form and replace the current state structure with another. In addition to the family and the State there are many other forms of human community. Sometimes these are mere groups, gathered together for some purpose but without any clear structure. Some groups, however, do possess a level of organization, and are therefore themselves called “organizations”. The key aspect of an organization is that it is a group (i.e. is possesses a purpose) with a form of internal government (i.e. a leadership structure of some kind, along with a set of policies or traditions that govern its existence and action). One of the realities regarding organizations is that they continue to exist even if the members change. A seniors club, for example, may continue to exist long after the original members have died or moved on, thanks to the influx of new members over time. Because the organization has an existence that transcends the individual members, it often also possesses its own assets as a kind of patrimony dedicated to the carrying out of the purpose of the organization. For example, the seniors club mentioned above may own its own clubhouse where the members meet. The clubhouse is part of the patrimony of the club. A key difficulty that often arises in the management of an organization, however, is this: who actually legally owns the assets involved? What if a power struggle erupts within the organization, for example, with one group wanting to sell certain assets and another group wanting to retain them? Who actually “owns” these assets, and therefore gets the right to decide? One obvious answer is that no one actually owns the assets, in that they are owned by the organization as a whole. While this may be true in theory, however, because the organization may not have any legal recognition of its existence, it is not possible for “the organization” to go to court and defend its rights. The difficulty mentioned above gets worse when we consider the debts of an organization. If the seniors club borrowed money to buy the clubhouse, for example, and then stops paying its debts, whom will the bank sue in order to get its money back? Once again, in theory “the organization” as a whole is responsible, but if it is not legally recognized then technically there is no one to actually sue. In such cases the leadership of the organization becomes personally responsible for the debts and other liabilities. On one level this seems only natural – after all, if a group of people is responsible for incurring a debt, they should be responsible for paying it back. But what if the debt was incurred by a previous administration? Or what if the debt arises out of something unforeseen, such as an accident on the property of the clubhouse? Is it really fair that the new administrators be held responsible for these things? Indeed, the fact that they would be is often a powerful disincentive for people to become involved in organizations. Society, of course, has an interest in fostering and promoting organizations, so it has developed a couple of legal mechanisms to deal with these issues: trusts, and corporations. A “trust” is founded on the basis of a legally recognized “trust document” of some kind. This document describes the assets to be managed and the purpose for which the trust is created. The document also describes who the leaders of the trust are, and how they are to be replaced. These leaders are called “trustees”, and the notion behind their appointment is that they are trustworthy to manage assets that are not their own for the purposes given. Once a trust is founded its assets are recognized to constitute a separate patrimony, and legal powers are given to the trustees to defend that patrimony in accordance with the purpose of the trust. A “corporation” takes this notion one step further. The word “corporation” comes from the Latin word “corpus”, meaning “body”. Just as a human body is composed of many parts which nevertheless work together despite their diversity, an organization is composed of many persons who each (in theory) contribute to the overall good of the organization as a whole. For an organization to be “incorporated” means that a particular legal jurisdiction gives a parallel status of “personhood” to the organization, recognizing that the organization is greater than the sum of its parts. And because this organization is now recognized as a legal person, it possesses a number of legal powers, such as the right to enter into contracts, to own assets, to borrow money, and so on. Of course, this new “virtual reality” person does not possess a brain to think with, for example, or hands with which to sign cheques, so it also has trusted people to manage its affairs. The title given to these persons is sometimes also “trustees”, but other titles also exist, such as “governor” or “director”. This last title is actually the most common. On a conceptual level, a trust and a corporation may seem to be the same thing, and in many ways they resemble each other. The key difference, apart from how they are managed legally in the different jurisdictions of the world, is in emphasis. A trust exists to manage assets in accordance with a purpose; an organization exists to promote a purpose and is given the powers it needs to get and use assets. Trusts, therefore, often have a temporary existence and may not even have any living members (for example, the executor of a will is acting as a trustee of the deceased person). Corporations, on the other hand, have a perpetual existence by definition – they only cease to exist if the same jurisdiction that gave them existence then revokes it. They also almost always have members, as the whole reason for their existence is to “incorporate” those members into a single “body”. Legal recognition as a corporation can only be given by a sovereign entity, such as a country or a province. This is because a corporation is given a number of rights, such as the right to defend itself in court, and therefore only the same body that runs the court system can offer incorporation to organizations. The technical name for the actual paper certifying the creation of a corporation is something like “letters patent” or “articles of incorporation”. In older times these letters patent were often signed by the king himself, and even today they must be issued by a sovereign entity or someone delegated by it. What happens, however, when a corporation wants to do business in a territory different from the one controlled by the original sovereign entity? For example, suppose a Canadian corporation wants to do business in France. It is recognized as a legal person in Canada, and so can go to court to defend its rights in Canada, but can it do so in France? In fact, the government of France must also recognize this corporation in order for the corporation to have legal rights. Usually an existing corporation simply needs to register itself within the new jurisdiction – it does not actually have to be “re-incorporated” within that jurisdiction. There are exceptions, though. In some countries, every kind of corporation needs to have a locally incorporated version. In other countries, only certain kinds of corporations need to follow this requirement. When it comes to the Catholic Church, there is a long-standing recognition that the Church is a sovereign entity. After all, the Holy See predates the vast majority of modern states, and the Catholic Church does possess its own internal court system for the settling of disputes. Catholic canon law even includes clauses related to the creation of what are called “juridical persons”: some of these are aggregates of goods (i.e. they are like trusts) while others are aggregates of persons (they are like corporations). Once a juridical person has been canonically created it possess certain rights within canon law as well. And one example of a juridical person within canon law is a parish, which is an aggregate of persons called “parishioners”. 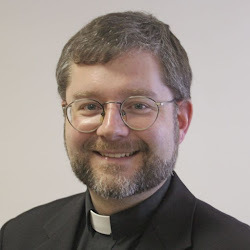 The ecclesiastical corporation remains incorporated only within canon law, and all the assets are actually owned by the corporation of the diocesan bishop (the “corporation sole” model often found in North America). The ecclesiastical corporation remains incorporated only within canon law, but a trust is established to govern the property. 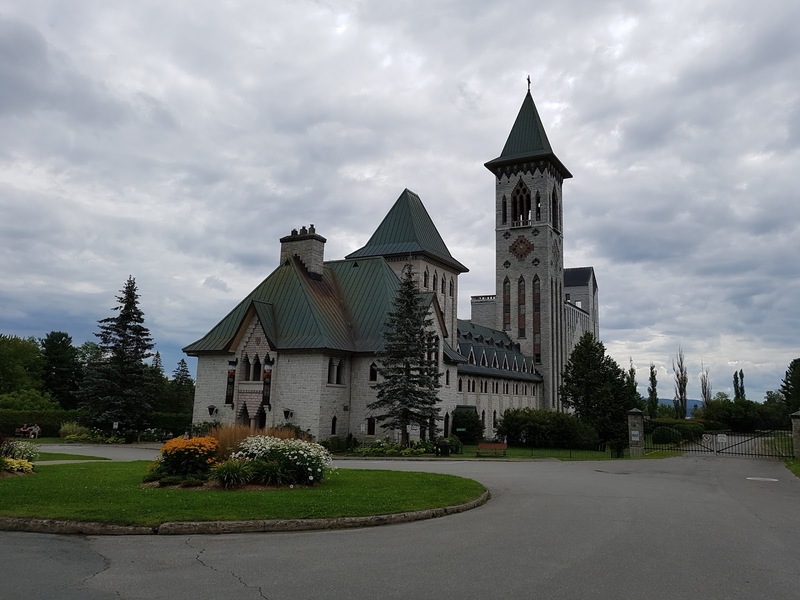 This is rarely done in North America, although ironically the Quebec model for parishes most closely resembles this approach (in that a civil corporation, the fabrique, acts like a trustee for the ecclesiastical corporation). The organization has only a civil incorporation, but applies to the Church for recognition (much like the above example where the Canadian corporation applies to France for recognition). This model is most typically used for associations of lay faithful, not for public ecclesiastical institutions (like parishes). The ecclesiastical corporation gets incorporated a second time within the local jurisdiction; it therefore has a kind of “double incorporation”, once within canon law, and once within civil law. The Roman Catholic Bishops Act (RSQ, chapter E-17) permits the creation of a corporation for each diocesan bishop, so that when the bishop is replaced as head of the diocese the corporation continues under the leadership of the new bishop; it also allows the diocesan bishop to himself incorporate new organizations, which then have automatic legal recognition as well. The Religious Corporations Act (RSQ, chapter C-71) generally governs corporations for religious orders. They have their own law because traditionally they possess a certain independence within canon law vis-à-vis the diocesan bishop, and so it would not be appropriate for them to be incorporated (and therefore governed) by the bishops as would be the case were they to be incorporated under the first law mentioned above. Because of this independent structure it is also possible for a non-Catholic group to seek incorporation under this law as well, although in practical terms most choose to simply get incorporated under the non-profit section of the regular law governing Quebec corporations (as it is more flexible). The Act Respecting Fabriques (RSQ, chapter F-1) is a special law meant to govern the most common form of ecclesiastical corporation: the parish. In canon law, a parish comes under the jurisdiction of a bishop but also possesses a certain independence of action. There are many stories of bishops who tried to boss around (or even dissolve) a parish and who found themselves having to defend their actions before a Roman ecclesiastical tribunal. Quebec recognizes this distinction by having its own parallel law specifically for parishes. The diocesan bishop decides to create a new parish. He issues an ecclesiastical decree to that effect, and the parish is constituted under canon law. This new parish is a legal person under canon law, but still has no right to represent itself under civil law (as this is a separate jurisdiction). The bishop therefore registers the existence of this new ecclesiastical corporation with the Quebec government. The Quebec government, rather than simply extending recognition of this ecclesiastical corporation, instead creates a separate civil corporation called a “fabrique”. The fabrique acts like a trustee on behalf of the parish, owning and managing all its assets for the sake of the purposes of the parish. In short, under the Quebec system two separate but related corporations actually come into existence. 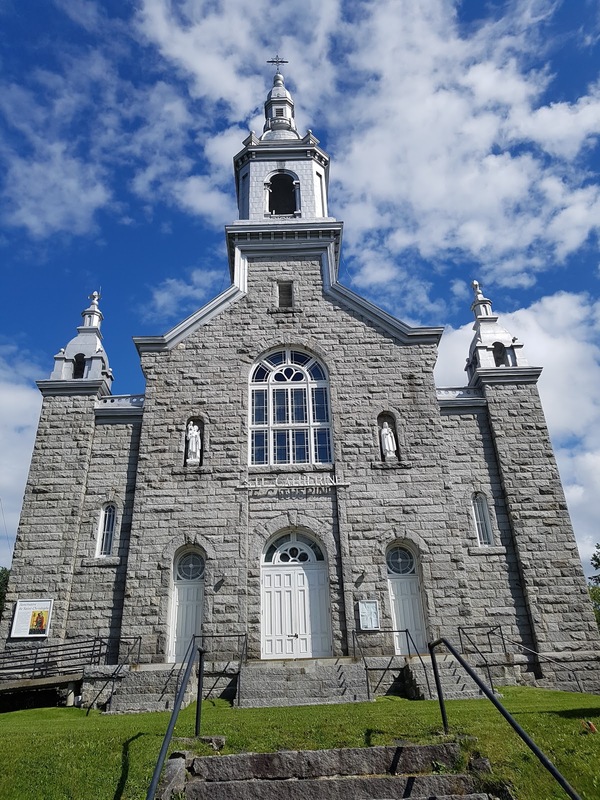 The parish comes into existence by the bishops decree but does not have any civil recognition within the province of Quebec, and so cannot own property or defend its rights in civil court. The fabrique comes into existence once this episcopal decree is deposited with the government (specifically, the Enterprise Registrar) and so therefore does have these powers, but the law that governs it restricts the use of those powers to the promotion of the purpose of the underlying parish. Purpose: The purpose is religious: strictly speaking it is undefined in canon law, but generally it is to engage in divine worship and acts of charity in accordance with the gospel. The purpose is strictly temporal: to acquire, possess, hold and administer property for the practice of the Roman Catholic religion in the parish for which it is constituted. Membership: Hundreds, possibly thousands of people: the Catholics that live within its territorial bounds (sometimes also limited by ethnic or ritual criteria), also known as parishioners. Seven or eight people: the pastor, six churchwardens elected from among the parishioners, and possibly an additional person appointed by the bishop to act as chairman. Leadership: The pastor, aided by the pastoral council and finance council (constituted according to the directives of the bishop). The pastoral council is a consultative body only, and sometimes does not even exist: the pastor usually has final say in pastoral matters. The finance council must exist, and where it does not two or three other persons are designated to assist the pastor in governing the temporal matters of the parish. The pastor often also has final say, but must consult for certain matters according to the directives of the diocesan bishop. (Note that, in Quebec, given that parishes each have a corresponding fabrique, they do not usually have a finance council: these duties are delegated to the fabrique.) The pastor is the automatic chairman if no external chairman has been appointed by the bishop. The chairman (pastor or not) has no special powers apart from the right to call and chair meetings of the fabrique. Only the fabrique as a whole may make decisions. A vice-chairman may also be appointed by the bishop, but only from among the current churchwardens; the vice-chair does not have the power to call meetings of the fabrique, but may preside over duly called meetings in the case the regular chairman is absent. A fabrique cannot hold a legal meeting without either the chairman or vice-chairman present. The parish-fabrique system as found in Quebec is meant to solve a particular problem, i.e. how a non-Quebec corporation (the parish) is legally allowed to own expensive properties, take out insurance, etc. The Quebec solution is to create a parallel civil corporation (the fabrique) to handle these temporal duties for the parish. In most cases, the system works well, but problems can arise due to the particular power relationships between the main stakeholders, i.e. the bishop, the pastor, and the churchwardens. While the bishop has the legal right to prevent the fabrique from undertaking certain actions (e.g. going to court, undertaking major renovations, undertaking risky investments), he is also very limited in what he can compel the fabrique to do. This applies as well to the pastor: even if the churchwardens are people of goodwill, there can sometimes be considerable resistance to necessary (but costly) pastoral initiatives. The pastor, after all, only has one vote in seven (or eight). And what if the churchwardens are not people of goodwill? Because the fabrique controls all the assets (including the money), if a clique of parishioners gets control of a fabrique they can make life a nightmare for the pastor (or even the diocesan bishop). Stories abound of churchwardens each having a key to the parish rectory, for example, coming and going as they please, or of churchwardens refusing to make necessary repairs to the residence of the priests. As well, the churchwardens do not always understand that they have no power on an individual basis, but only as a group when voting on something (or when specifically delegated to carry out something that has been voted on). A certain arrogance sometimes sets in: a lay chairman, for example, may begin to think he is “President of the Parish” and the pastor is his employee (therefore turning the fabrique into a congregationalist parish, in fact if not in theory). Pastors also do not always understand the possibility of these power dynamics. As already stated, things usually work out well, but in cases of tension or conflict a pastor who tries to “throw his weight around” can find himself in trouble quite quickly. Rather than being diplomatic he may act in an even-more authoritative manner, which is then felt as bullying (thereby increasing resistance even more). Sometimes the pastor instead begins to act secretively, hoping to by-pass the fabrique, but this then breeds more suspicion. Often the pastor, feeling terribly frustrated by the hampering of his pastoral drive by potential delays, appeals to the bishop for him to “do something”, not understanding that in many cases there is little that the bishop can do except hope that the obstructionist churchwardens do not get re-elected at the next annual meeting of the parishioners. A fabrique can only make legal decisions at a legal meeting of the churchwardens. For a fabrique meeting to be legally valid, the churchwardens need to be given proper advance notice (i.e. they get the notice on Monday for a meeting on Friday, with Tuesday, Wednesday and Thursday being the three clear days typically required). This advance notice also needs to mention the business that will be discussed at the meeting – no new items may be added at the meeting itself except for information purposes only. While many fabriques set out a schedule of meetings for the entire year to allow the churchwardens the chance to reserve the dates in their agendas, a formal notice of meeting must still be sent for each individual fabrique meeting. For a fabrique meeting to be legal it must be presided by the chairman or vice-chairman. A fabrique may only make decisions according to the powers given to it by the Fabrique Act. Many of these decisions require the approval of the bishop before they can be implemented; others also require approval by a meeting of the parishioners. If churchwardens put into practice any decisions that were made at a meeting that was not legally valid, or any decisions that required the approval of the bishop and/or parishioners but for which this approval was not obtained, those churchwardens (including the pastor) become personally liable for the financial consequences of that decision. For example, if a fabrique signs a renovations contract without prior diocesan approval, and problems arise, the churchwardens can be personally sued by the other company (instead of just the fabrique being sued). The items discussed at a fabrique meeting should be limited to the acquisition and management of the property required for the activities of the parish. This is, after all, the legal purpose of the fabrique. The actual spiritual life and direction of the parish is for the parish itself, as a separate entity, to look after. Pastoral leadership of a Roman Catholic parish in Quebec is a tricky thing. A pastor must be a leader, but must exercise this leadership with patience and diplomacy. The churchwardens have a legal responsibility to act in the best interests of the parish, and the pastor should recognize and respect this fact and help them as best he can in this duty. Transparency and tidy administration are critical to avoiding distrust, and pay off in the long run. In short, just as the parish and fabrique are partner corporations, the pastor and his churchwardens are also partners. I was recently asked where the videos from our Parish Vitality Conference 2014 could be found online. I decided to make a playlist to help people do just that. Enjoy! I've been updating my series on my personal journey of faith. I've added a back post dated back to 2012, called "The Power of Reconciliation". Enjoy! I had an unique opportunity this morning: I celebrated mass at Saint Joseph's Oratory at 8:30 am -- a mass that was televised by Salt and Light TV. While I've celebrated mass many times (obviously), I've never done so for TV before. You have to be very present to the celebration, particularly given that there are important time constraints involved (i.e. you need to keep to the time slot given to you). In our case we have 30 minutes, and I managed to keep it to 32 up to the final blessings. It is a good discipline, especially for the homily. Next time I'll keep it to the actual 30. I'll be honest, I was dreading to do this at first. I'm not much of a performer. Still, it was good to this, and in my homily I even addressed the television audience directly, giving people some spiritual "homework". Heck, it was fun, and I'm looking forward to doing it again.